A Funny Thing Happened ..
A funny thing happened on my way home last night. I was wrapping up another 10-hour day. After work, I had made a shopping trip to the grocery store, already worn out from a full day of programming on The Job, and perhaps not as situationally aware as I should have been. It was "Trash Day"; I had to move the trash can from the curbside back to the patio, and I was reluctant to park in my alternative behind-her-car location just in front of the carport, because I would have had to drag the trash can around my car to the patio entrance. So I stopped a bit short of the patio gate, racked the steering-column mounted gear selector to "PARK", opened the door and bailed out to move the trash can to it's normal place on the patio. Suddenly I had a vertigo moment; it seemed as if the world was moving and I was standing still. But that was wrong. I was standing in one place. The car was moving. And I was not 'standing'. I had been swept off my feet. I was hanging onto the door, one hand on the front seat, trying desperately not to lose my grip on the moving platform. I immediately perceived that I had NOT move the shift lever to "PARK". Instead, I had not moved it past REVERSE. The truck (a Ford Explorer ... "Big Ol' Truck!") was slowly rolling backwards, sweeping (dragging!) my body backwards by the open car door. I was shuffling my feet to keep up with the moving truck; but this was obviously a temporary expedient which I could not maintain for more than another few seconds until I lost my balance and fell under the front wheel. A moment of panic; a moment of realization; and another moment of realization that if I lost my tentative grip on the door the truck would drop me on the ground and the front wheel would roll over various non-expendable portions of my anatomy. In an uncharacteristic instant of clarity, I realized that my only option was to stop the movement of the truck. Unable to reach the brake (or perhaps it didn't occur to me to push the brake pedal with my hand), I threw my right hand up and over the steering wheel, fortunately grabbing the gear-shift lever and bumping it UP to the "PARK" position. The transmission ground for a second, and then kicked up into PARK. Giving a profound sigh of relief, I regained my feet and stood on wobbly legs. Then I went back to "normal" mode. Closed the door, moved the trash can back to the patio, and painfully (I had scraped my knee somehow) moved the truck forward to finally park behind SWMBO's car, which was under the carport. When I went inside, I recounted my brush with death (or maiming) to SWMBO, who was properly horrified. She has since moved her car to the GUEST parking sport, leaving the carport available to me. Sure it's only reasonable. She rarely is able to drive, and I park in her apartment lot six nights a week. But I am disappointed that my lack of Situational Awareness had caused her to inconvenience herself in the rare moments when she has need to drive her car. On the other hand, I'm incredibly thankful that I don't have to search for a parking spot at Chez SWMBO any more. It's not just a convenience; for a worn out old Geek, it is an acknowledgment that I'm getting too old for this sh*t.
To all my friends. DO NOT respond to an e-mail from Bank of America. Mine said that they were having problems with my ON-LINE ACCOUNT. I have not had an account with BofA for over 40 years. If you open anything in the e-mail, who knows what you will let into your computer. I called BofA and was told that I had received a fraudulent e-mail. It DID NOT come from BofA. They are well aware of the problem and HOPEFULLY DOING SOMETHING ABOUT IT. There is nothing new about this, but it serves as both a reminder that The Bad Guys are still out there, and also they're still trying to (a) get your personal information; or (b) dump a virus on your computer; or (c) all of the above. Thank you, Walt, for keeping us aware. And for all of us --- be careful out there. Be aware of the links that show up, and remember that banks and other financial (and governmental) institutions almost NEVER send you an email except in response to an email which you have sent to them. If in doubt, contact your institution by phone or, if its someone with you have an established relationship, go to their home website (do NOT click on links you find in the email!) and follow up on their "Help" or "Support" link. And always, ALWAYS report an apparently 'bogus' email ... again, by going to their official website. Most have a link specifically designed to "report suspicious email" or similar wording. Last Saturday, friend Walt wandered down to ARPC to act as "Demonstrator" at the monthly Introduction to USPSA class which I teach for the club. Walt regularly assists "Iron Fred" at the Tri-County Gun Club "certification course". The purpose of that course of instruction is the same as the ARPC course: to introduce new would-be competitors to the rules, regulations and SAFETY PRIORITIES involved in USPSA competition. He had asked me last month how I could teach the course in three hours, when at TCGC it requires an eight-hour day to perform the same function. So I invited him to come down and watch the March class so he could witness first-hand how the the class was conducted. Sometimes Demonstrators volunteer; sometimes they are drafted! Let the students perform the exercise. Walt was doing the 2nd step. And he threw in a lot of unexpected frills, such as multiple failure-to-feed situations which allowed him to demonstrate the "Slap/Rack/Bang" drill. I still don't know how he managed to get his 1911-style single-stack pistol in .38 Super to jam so consistently! Nice job, Walt. At the end of the day, Walt and I took a few minutes so he could brief me on his conclusions. He said that the difference was not so much the course syllabus, format, or style. It was in the experience level of the students who attended the classes. As soon as he said that, I immediately understood exactly what he was saying. I had the same problem when I first began to instruct the course. Others were not aware of the basic Rules of Firearm Safety. Still others were suffering from 'beginning shooter' issues: They didn't know how to hold their pistol, they tended to be easily distracted from the serious business of firing a deadly weapon, or they were afraid of recoil of even of the firearm itself. I had discussed this issue with Club Competition Director Mike McCarter, and we came to the agreement that he would 'filter' the class list. He would insure that they were already trained in Basic Firearms Safety -- either by virtue of having taken the class which is offered at ARPC, or by their own level of personal experience -- before they were allowed to take this "advanced" class. Apparently TCGC does not perform this function, so the lead instructor (Iron Fred) and his assistants (Walt, and others) never knew what level of expertise they could expect from their students. A second difference between the two courses is that the TCGC spends the morning (3 to 4 hours) going over the USPSA rule book, and after lunch they adjourn to the shooting bays for another 3 to 4 hours in the Live Fire Exercise. I'm satisfied that the 3 hour course is both feasible and adequate, if the students are sufficiently familiar and competent with their firearms and the principles and practice of safe gun-handling. Walt has told me that he will be writing up a report, or a review, of his observations and experience last week, and he will send me a copy to read and comment on before he submits it to TCGC. I do not expect that I will ask him to change the report; I know Walt and I can't imagine him turning in a report which is not factual, accurate, complete and fair. But I'm still anxious to read the report if only to see what his evaluation is going to look like after he has had some time to consider his impression. You ask: "Hey, is that it? We expected you to talk about Glocks here, and you haven't mentioned them in the entire article! What gives?" After the class was finished, Walt trotted out his new pistol and invited/encouraged me to try it out. Walt knows full well that I am no fan of the Glock; it has been a running joke for over a decade how little love I have for the Glock Pistol. 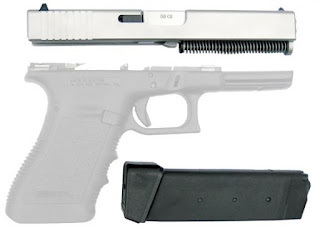 Given sufficient encouragement, I will grudgingly admit to some of the positive aspects of the Glock. These usually are in the general vein of "That is one UGLY gun!" Or, "how many rounds can you get between "Ka-BOOM! events?" The first thing I noticed was that the trigger was really quite good. I didn't like the 'creep' of the trigger, but it was quite crisp and I assume that with practice one would become quite comfortable with such a long trigger pull. The second thing was the excellence of the sights. Very crisp, easy to see (they had the little light-green dots on front and rear sights, which helped a LOT; I assume they are night sights). Every shot went right in the center of the A-zone, with no "flyers" at all. The third thing was that the grip angle was not as 'foreign' feeling to my 1911-spoiled hands. I don't know that it was because it has changed from earlier models I have fired, or I'm mellowing with age. The fourth thing was that the construction was really rugged! This is a whole hunk of oughta-be metal, even though I know it's mostly polymer, and the grip filled my large hands we enough that I was confident I control the recoil. The fifth was that the recoil was not as bad as I expected. A little explanation of terms: the actual "felt recoil" ... the gun pushing back against my grip ... was entirely comfortable. I had wondered if the .50 caliber bullet would see excessively punishing, but it was very soft. On the other hand, what I would normally call "muzzle flip" was similar to that which I have experienced when shooting my .41 magnum Ruger Blackhawk Revolver. The Blackhawk , of course, has a single-action configuration which expects that you will soften perceived recoil by allowing the momentum to translate to vertical movement as the slick stocks allow the rotational energy to be ignored. That requires that the shooter re-acquire his grip on the pistol for each succeeding shot, of course. The Glock didn't slip in my hands, but I had no sensation of the pistol trying to 'twist'. It was very comfortable .... but there was no way I was going to get good split times and still keep the sights on the A-zone. Comparing it to a full-power 10mm load in my STI Edge ... the two are actually quite similar. That Glock ROCKS! ... literally. Not suitable for USPSA or IDPA or Speed Steel competition? No, not really. But it wasn't as bad as one might have expected from the "Fifty Caliber" designation. Still, it isn't a bruiser, and as long as one avoids anticipation of recoil it's not a bad shooter. The sixth, and final thing I noticed about Walt's 50 Glock was ... that ever-to-be-cursed trigger safety! Every shot ... I repeat, every shot ... I took with this pistol hurt. How? That sucker bites; hard. Somehow, on the recoil (not before the shot) that trigger safety managed to pinch just enough of the skin on my trigger finger between the trigger and the safety. Yes, the recoil is not bad. But I can see how repeated shooting (such as the 150 - 200 rounds fired in a typical USPSA match) would constitute a form of aversion training. That is, one would learn through experience to expect the uncomfortable sensation of being pinch with every shot, and eventually the anticipation of that "punishment" would cause the shooter to react as badly (eg: the "flinch" phenomenon) as fear of recoil. Arguably, this particular Glock may be an exception. I've fired (often reluctantly) several Glocks and, while I don't care for the ergonomics, I've never been pinched by the trigger safety. I don't know if the trigger assembly has been fitted incorrectly, or it is a design flaw. Also, in full disclosure, I have been suffering from eczema on my fingers for the past two years, and it may be that my skin is just a little thinner than it should be (although the eczema never directly affected the tips of my fingers). Which is to say, I just may be too sensitive; this may not happen to other shooters. Overall rating, this is just about the nicest shooting, and easiest to shoot, of the half-dozen or so Glocks I have fired, including the 10mm Glock shooting full-power loads, the 9mm, and the .40 S&W. Taking in consideration, of course, that the power factor is significantly higher. Other than the safety, I liked the safety, I liked the sights, and I even almost liked the way it handles. I just wish I had the foresight to take a picture of the pistol. Maybe Walt will be able to furnish me with one. Depends on how long he keeps it, I guess. I assume this was the .50 caliber conversion from American Tactical Imports. Here is a video of Michael Ban talking with Alec Zimmerman of TCI.